Between work, family and other obligations, stress is a common part of life. But while it's something we all deal with from time to time, stress can have a negative impact on your health. Worry and overwork can lead to unhealthy lifestyle habits, which causes more stress, leading to a very harmful cycle. For example, if you are facing a very tight deadline at work, you might make poor choices about what to eat, relying on sugar and caffeine to get you through the day. Unfortunately, these food choices can create more stress in the long run, as well as other problems. Below is a list of common bad habits people sometimes indulge in when overwhelmed and worried. Drinking too Much Coffee: When burning the candle at both ends, you may find yourself drinking several cups of coffee through the day to keep yourself going. 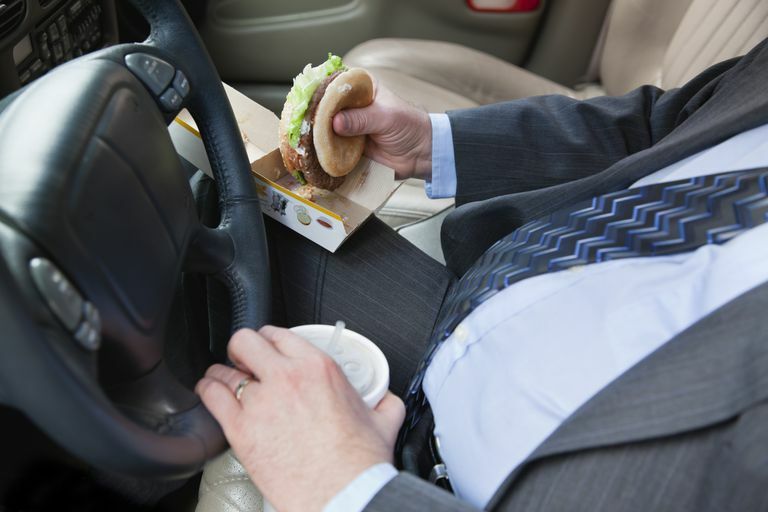 Eating the Wrong Foods: Due partially to increased levels of cortisol, the stress hormone, stressed people tend to crave foods high in fat, sugar, and salt. Many will turn to potato chips, ice cream or other junk foods after a rough day. Skipping Meals: When you are juggling a dozen things at once, eating a healthy meal often drops down in priorities. You might find yourself skipping breakfast because you're running late or not eating lunch because there's just too much on your to-do list. Mindless Munching: Conversely, stress also makes us prone to emotional eating, where we eat despite not being hungry but eat because it feels comforting. Forgetting Water: With busy lives, it’s easy to forget to drink your water, In fact, a good portion of Americans drink no water, and get water only from soda or coffee. Fast Food: People these days eat at home less than in generations past, as it’s easier to just drive through a fast food place or go to a restaurant than to go home and cook something. Unfortunately, this gets expensive and is often unhealthy. Crash Diets: Because of weight gain from stress, some people intentionally eat less food than they need, or try dangerous fad diets in order to lose the excess weight. Diets that aren’t balanced with fruits and vegetables, protein and healthy carbohydrates can often be bad for your health in the long run, even if they look attractive short term. Blood Sugar Imbalances: When you don’t eat enough food or don’t eat food with necessary nutrients, you can experience blood sugar fluctuations. These fluctuations can lead to mood swings, fatigue, poor concentration and other negative consequences in the short term, and greater health problems like hyperglycemia in the long run. Caffeine Side Effects: Too much caffeine can lead to poor concentration, lower levels of productivity, sleep disturbances and increased levels of cortisol in the blood, as well as other negative effects. Poor Health Outcomes: Poor nutrition can also lead to lowered immunity so you’re more susceptible to illnesses, both minor and major. As you can imagine, this can lead to other problems, including increased stress levels because you're sick when a major project is coming up. There are several things you can do to make healthy food choices, no matter how packed your schedule may be. Here’s a list of 10 ways to ensure better nutrition that can work for even the busiest people. Try some or all of them, and you should find yourself feeling healthy, more productive and less stressed. Sapolsky, R. "Why Do We Eat Junk Food When We're Anxious?" The Wall Street Journal, 2013.